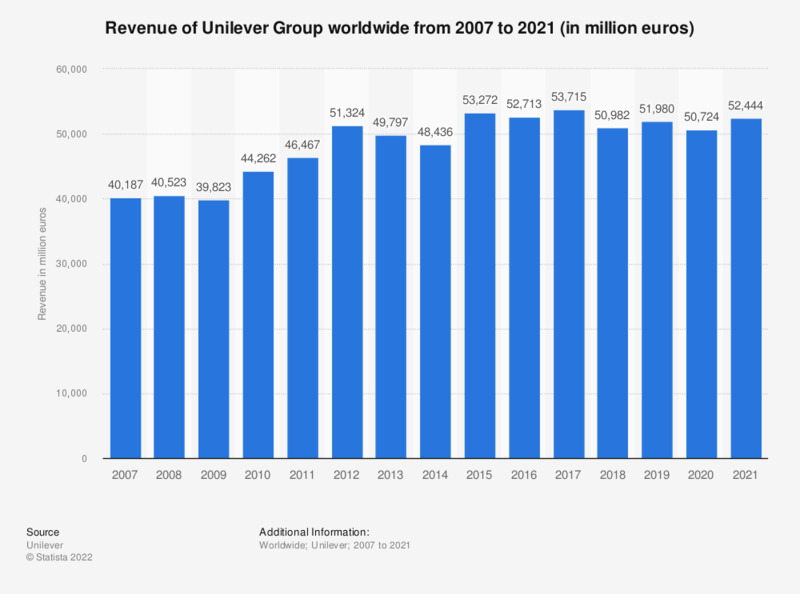 This statistic depicts the revenue of the Unilever Group worldwide from 2007 to 2018. In 2018, the global revenue generated by the Unilever Group was approximately 50.98 billion euros. Unilever operates in nearly 190 countries around the world and has been a traditional paragon of excellence and quality in the Fast Moving Consumer Goods sector. The company derives its competitive advantage from its global footprint and its track record of enhancing value for the consumers around the world. The company has four major product segments: personal care, foods, refreshments and home care; with the former generating the most revenue for the company. In 2014, Unilever employed over 170,000 people. With more than 400 brands focused on health and wellbeing, no company touches so many people’s lives in so many different ways. Unilever's portfolio ranges from nutritionally balanced foods to indulgent ice creams, affordable soaps, luxurious shampoos and everyday household care products which includes world-leading brands such as Lipton, Knorr, Dove, Axe, Hellmann’s and Omo, alongside trusted local names such as Blue Band, Pureit and Suave. Unilever strives to make sustainable living commonplace. They work to create a better future every day, with brands and services that help people feel good, look good, and get more out of life. Everything On "Unilever" in One Document: Edited and Divided into Handy Chapters. Including Detailed References.